Goggles! 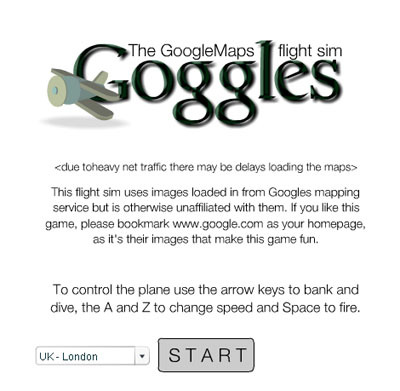 The Google Maps Flight Simulator. 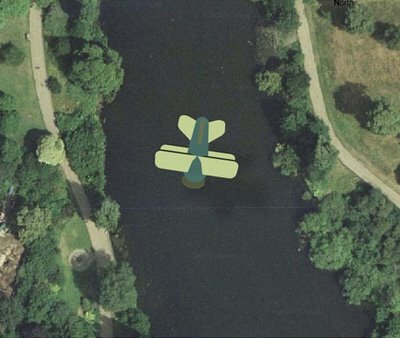 This site uses the power of Google Maps to create a game where you control an airplane which can fly to anywhere in the entire world (if you have enough time). You can make the plane go right, left, up and down. If you go down too far, you crash. Also, you can make your airplane fire missiles, which is kind of weird because they don't do anything! Starting places include London, New York, Dublin, Boston, Paris, Helsinki, and more. This program is what generates the imagery in the site above. Its really cool; if you haven't already, you should download it today (for free). I didn't know Google had made this. Free No Deposit Online Casino Bonuses, Repeat Deposit Deals, Casino Promotions, Savvy Gambling Advice.